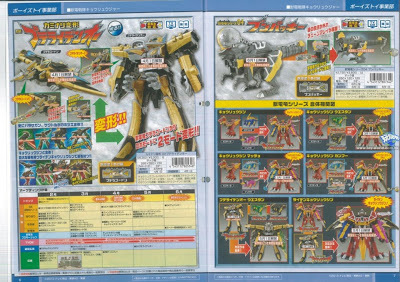 Wow this was fast, Zyuden Sentai Kyoryuger haven't aired yet but we now have more details of the 6th ranger, KyoryuGold through recently published toy listings. 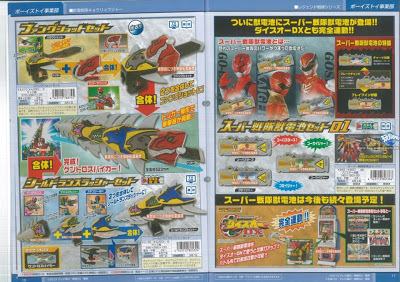 According to the scan, his transformation device is called GabriChanger and his initial weapon is called the Zander Thunder. Both items are based off from Pterosaur, and slated for April release. Here are more toys for the rest of the team namely: GabuTyra Fang (Red), ParaShot (Black), StegoShield (Blue), ZactorSlasher (Green), and DriceraLance (Pink). The first two made up the DX FangShot Set, while the remaining three forms the ShieldLanSlasher Set. Combining weapons will form a huge sword called the KentroSpiker. These are pegged for March release. Last is 6th Zyudenryu, Pteragodon, that will transform (Kaminari Henkei, Thunder Transformation) into Pteraiden-Oh. Combine Parasagun and Zactor to form Pteraiden-Oh Western, and to Kyoryuzin to form RaidenKyoryuzin. These additions will be released also in April. 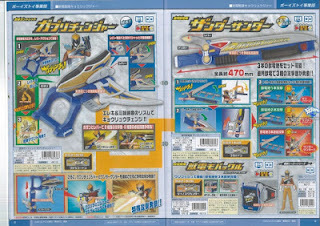 Along with it is the Zyudenchi #8 Bunpachy, which can attach (?) to Kyoryuzin to form Kyoryuzin Kung-Fu. It will be released this June.